Former New York City Mayor Michael Bloomberg blamed Wednesday the frigid cold temperatures sweeping the Midwest on global warming, arguing that climate change makes weather events more extreme. The billionaire Bloomberg has made trips to Iowa and New Hampshire in recent weeks as he considers running for president as a Democrat, with gun control and climate change among his top issues. 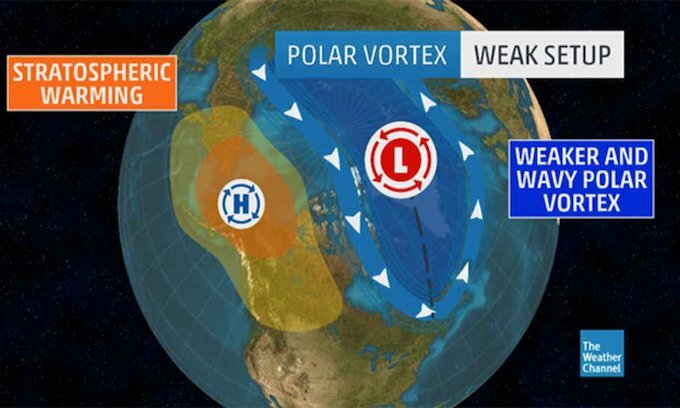 The polar vortex, which sent sub-zero temperatures Wednesday through the Upper Midwest, has also fueled the debate over whether extreme cold weather is the result of climate change driven by increased atmospheric emissions. “U.S. Midwest Freezes, Australia Burns: This is the Age of Weather Extremes,” said the headline of a Tuesday news article in the New York Times. Roger A. Pielke Sr., senior research scientist at the University of Colorado Boulder’s Cooperative Institute for Research in Environmental Sciences, said the polar-vortex phenomenon isn’t new. Mr. Bloomberg has said that he expects to decide on whether to run for president early this year. Lord knows if anyone would be a “climate expert”, it’d be Bloomberg. He learned from the best…… that idiot Al Gore. The theory behind green-house gases causing “Global-warming” was that human activities; fossil-fuel consumption being the primary cause, was creating inordinate & threateningly high-levels of CO2/green-house gases; creating a “thermal-blanket” that didn’t permit excess trapped solar-energy (heat) to naturally escape the earth’s atmosphere. …but then, temperature measurements didn’t support chicken-little’s thesis and computer-models showing CO2 trapping heat and causing rising temperatures. Initially, NOAA & NSA simply adjusted temperature readings; “cooling” earlier records, and inflating recent readings to support “HOTTEST YEAR EVER!” media releases. When that got to be untenable (people kept reporting on their “adjustments”), then global-warming became “climate-change,” where green-house gases trapped excess solar heat causing hotter global temperatures; AND—it caused record cold—AT THE SAME TIME! It is perhaps the greatest marketing campaign every! No matter what happens…or doesn’t happen, it’s the result of climate-change. The ONLY way to save the doomed planet? A massive new planet-wide socialist government; providing transfer-payments of western wealth to obtain global income-equality. The Sun is entering a cycle with little to no sunspot activity, which reduces solar output, which lowers the temperatures on Earth. They are already adjusting temperatures to force them to fit the selected narrative, they will have to double their adjustments just to stay with the temperatures they report now. Bloomers should read the Bible, specifically Revelation, which foretells many events happening in this time period, as the last days before Jesus Returns. It speaks of weather events taking place in areas normally not receiving them, various places, stronger, and more numerous than any previously. Things are following Gods’ plan, not global warming. Also events in our History record, many events, happen at various intervals then repeat at other times. It’s all there, foretold by the Bible quite openly, and very accurately. Exactly. God has control over the weather patterns, including any “extreme weather”. Soccer moms driving SUV’s cannot wreck the climate. God’s running the show. Anthropogenic Global Warming only makes sense if you attribute godlike powers to men, but consider them a virus. Then attribute “living planet” status to the Earth and consider it the Earth goddess Gaia. Lotsa mental gymnastics there. Very convoluted logic. Everything about Global Warming is a lie. Calling it Climate Change and trying to say it’s completely different is just another lie. Bloomberg is an idiot, just like his fellow New Yorker, AOC. All I can say is thank God for fossil fuels. If we were to follow AOC ideas and depend on her New Green Deal proposal, one third of the US would be frozen solid today. Solar power, wind power, and hydropower energy sources wouldn’t have been enough to keep warm all of the Americans struggling through this cold spell. The use of good old fossil fuel is all that saved one third of the US population from freezing to death. Solar panels covered in snow. Useless. Rivers and streams frozen. Hydro is useless. Wind turbines freeze up (happens more than you think). Worse than useless. You need to spend electricity to keep the turbines warm so they don’t get damaged. In a deep chill, green energy = no energy. Then there’s nuclear. It works just fine day or night, wet or dry, cold or hot. Overcast? Not a problem. It puts out constant reliable baseload power. But on the downside, nuclear is much safer than solar, hydro, or wind energy. Or any other energy really. Oh wait, that’s not a downside. It’s a major plus. So, let me get this straight . . . if it gets very warm, it’s due to “global warming”, and if it gets very cold . . . it’s due to “global warming”???!!! Did I miss something? Well if you remember, it used to be “WE ARE HEADING TO A NEW ICE AGE” in the 70 and 80s.. Then it morphed to global warming in the 90s.. So they just say “climate change” now days..
Bloomberg demonstrates that colder temperatures caused by global warming actually slows down thinking among Democrats from New York. Can you identify other examples? THeir brains have been rotted by liberalism. Kind of hard to slow down what they don’t have. Maybe he misspoke, and meant that the Earth is entering a cooling phase. Most libtards conveniently fail to mention the other part of the global warming story which is global cooling. Facts and truth, as we were reminded by Al “Wooden Indian” Gore, can be quite inconvenient so why bother mentioning them at all if they don’t advance the cause of your narrative. By omitting the other half of the story though it makes the entire argument completely specious and suspect.Even top NASA scientists have pointed out, the lack of observable sunspots indicates the earth is actually entering a mini ice age. Bloomberg’s only political expertise is in making laws to ban things he doesn’t want his inferiors, aka all us lowly masses of non-wealthy people, to have, such as salt, sugar, bottled formula instead of breast milk for newborns, opinions or views different from his, etc. He is honorary member of the Mystery Science conglomeration of bought & paid for flunkies & Dem politicians who, despite indisputable evidence of thousands or millions of years of extreme & uncontrollable climate & weather changes, now insist they have the ability to regulate & eliminate extreme climate & weather but only if all non-wealthy Americans are forced to pay unlimited gazillions of dollars to help ban / prohibit America & the entire planet of non-wealthy people from having access to any source of energy that is not approved by Bloomberg at al. How about we ban Bloomberg, Cortez & Sanders & all the rest of the idiots & fools who want to force us to restrict our access to reliable affordable energy while we bankrupt ourselves & wait possibly for generations for an incoherent mysterious & currently hypothetical & unfeasible Green New Deal to materialize. Come ON people, OPEN YOUR EYES to the SCAM, it’s NOT settled science, not even CLOSE, and it’s going to get a LOT colder for the next60-70 years as the SUN is in MINIMUM phase! Better stock up on WARM things, you’re gonna NEED them “agw” fools! There has NOT been even ONE of al gores predictions that has come to pass, NOT EVEN ONE!!!! Mikey should keep his little helmet on all the time and not go outside because he might hurt himself. Na.. Have him go out, neked.. THEN He’d really see “Global warming” in action! Preferably up in the tip of Minessota. If the above is so, anyone can cause a hurricane by swirling their pinky finger around or turn the Pacific into an empty pit by thinking ‘dry thoughts.’ This is how outrageously arrogant it is of these pseudo-scientists to claim that mankind can alter the patterns of nature which were designed by Almighty God.